Intimité. Près de Fallingwater, Kentuck Knob, Ohiopyle et GAP. Le printemps arrive à grands pas. Consultez nos critiques 5 étoiles et planifiez une visite bientôt. Aventure à proximité. Fisherman - pond est stocké et prêt pour votre usage exclusif. Entouré par plus de 800 hectares - de prairies et de bois. Nous sommes à quelques minutes de route de Fallingwater / Kentuck Knob, du parc national Ohiopyle, de Somerset, en Pennsylvanie et de Forbes State Forest. De nombreuses possibilités d'aventure et / ou de retraite tranquille entourées de forêts et de prairies, notre chalet en offre plusieurs. Notre chalet contemporain est niché entre un étang et une forêt sur notre ferme de montagne de 1780. Si vous êtes pêcheur, vous êtes invités à pêcher dans notre étang approvisionné (réservé aux clients de ce chalet). Capturer et lâcher - achigan à grande bouche, crapet à tête rousse, catties et bluegill. It was a quite little place to stay put of the way. The property was nicely maintained, and perfectly described on the website. I felt completely prepared for our stay and able to relax the moment we walked in. Very cozy and relaxing cottage in a beautiful part of Pennsylvania! 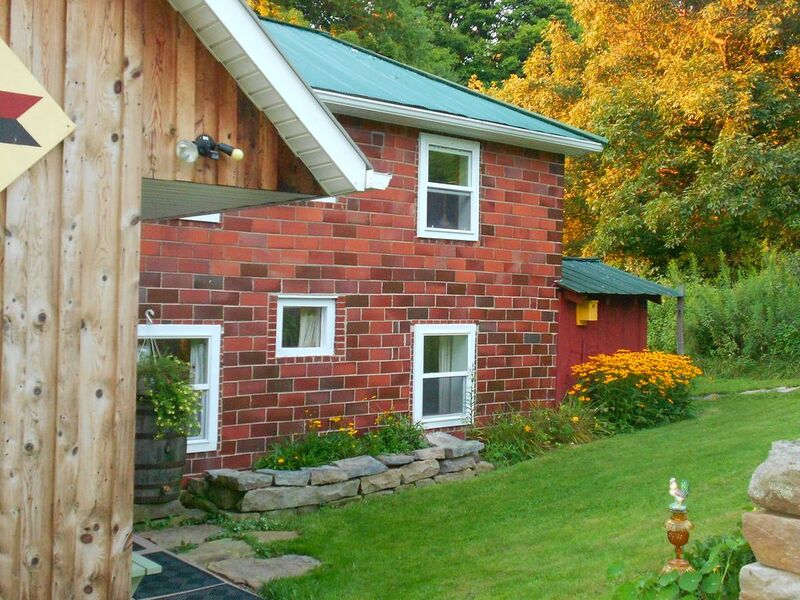 This is probably one of the cutest cottages out there! We really enjoyed our stay here. The cottage was very accommodating; fully stocked kitchen as well as plenty of sources for heating. The little sunroom/dining room was great. We enjoyed watching all the wildlife come so close to the windows. We saw so many birds, chipmunks, a cute little red squirrel, and even a possum ventured by at one point during the night. It was very cool to watch all the animals. It was also so quiet there. I have never been anywhere where you can’t hear a single thing. Our first night there, there wasn’t even wind blowing the trees. There wasn’t a single noise. Very tranquil. It’s a nice break from the chaos of living near the city. There’s also lots of puzzles and a selection of DVDs which was nice. The cottage was also very clean as well. It’s a short drive to Confluence which has two grocery stores and a handful of cafes. It’s also very close to the highest point in PA, Mount Davis. We were able to go on a nice hike up there and climb to the top of the observation tower and see miles of mountains. It was a very high climb, but it was well worth it. We thoroughly enjoyed our stay here and hope to be back soon! Thanks for the awesome experience! I loved this house, it was perfect for just my husband and I. Remote, relaxing, and calming. We would stay here again if given the opportunity to get away! Peaceful cozy cottage tucked away in a beautiful setting! Very charming cottage in a beautiful location! Accomadating owners that was fast to respond to my email inquiries and I'm sure would have been just as quick had I needed anything during my stay...but I didn't need anything because everything was perfect! Looking forward to future visits to experience this place in every season! What a great place to get away, watch the wildlife and the pond each morning. Mona and Bryon are excellent hosts who have provided so many nice touches and excellent communication. We really enjoyed the place and going back again during summer time. It was so peaceful and quiet. It was indeed a great weekend away form city chaos. Thank you Brayon and Mona for having us. Cheers!